Gloomy weather didn’t keep things from shining at the Wire Harness Manufacturers Association Annual Conference at The Scott Spa & Resort in Scottsdale, Arizona this past February. Attendees were treated to timely and relevant seminars and, as always, priceless networking opportunities. The WHMA board begins work a year in advance to build a conference experience designed to lead, educate and connect members. That hard work was apparent once again. If you’re a football fan, you would be blown away by the past three WHMA Keynote speakers. Rocky Bleier in 2016, Joe Theismann in 2017 and Burgess Owens at the most recent event. Burgess had 12 seasons with the New York Jets. Although he played well, and was an inspiration to his teammates, the team’s record was anything but stellar. But he got a chance to play with the Los Angeles Raiders his 13th season. This time his contributions led to a Super Bowl win. He feels strongly that everybody has a 13th season, but that’s it’s the hard work and dedication of the earlier ones that truly shape one as a professional. It all comes down to tenacity, faith and service. He also spoke about another important concept that helped him along the way. It was a part of his presentation he called, The Camera. Burgess described how the Monday’s practice after game day consisted mostly of viewing video from Sundays game. He knew his teammates would be watching that film, and he wanted them to see him playing his level best, even when the score heavily favored the opponent. He ‘plays for the camera’ every day both personally and professionally, and attributes much of his success to this edict. Next up was Winn Wise, President of Southwire’s OEM Division. With his presentation titled “The New Era of the Wire and Cable Industry.” Winn outlined the technology disrupters and trends that are aﬀecting the industry. 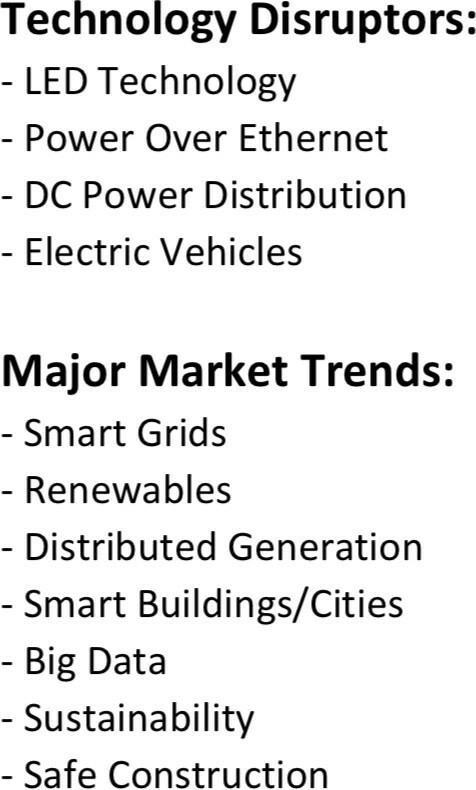 He sees the disruptors and trends as a matrix for decision making (Table 1). Next was Loren Smith, CEO and Sole Shareholder of Blue Valley Capital. Loren has spearheaded the sale and purchase of dozens of mid-market manufacturing companies and his presentation focused on the factors in getting a deal done along with some case studies. Special note should be given to the sponsors of all of the events at the WHMA Conference. The Tuesday evening Exhibitor Reception was co-sponsored by Cirrus and Schleuniger. The Wednesday Breakfast With Exhibitors was sponsored by Mentor, and lunch was covered by Entrada Group. 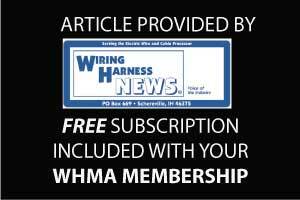 Thursday’s breakfast was sponsored by Wiring Harness News and lunch was hosted by DMC. Panduit sponsored both the Wednesday and Thursday round table discussions. A new feature for WHMA is the Tuesday evening “First Timer” reception which was sponsored by Synopsys. Many thanks to IEWC for sponsoring the Wednesday Evening Social Event. As it was in 2016, the event was held at Octane Raceway indoor go cart track. Attendees got to compete in several heats, with a final race for the top drivers. The food was great, and the laughs were many. Thanks once again to IEWC for making this happen. In addition to an educated seller and motivated buyer, an eﬀective, non-boiler plate, selling document must be prepared. There should be open communication and both parties must be fully committed to getting the deal done. All of this must be done in the strictest of confidentiality which requires buyer and seller to be people of integrity. Donnie Hill, President of Precision Manufacturing, and Vice Chairman of WHMA, presented an update on the IPC/ WHMA A-620 Standard. Donnie outlined the changes in the new Rev C saying that about 40% of the document was updated from Rev B. The changes really represent Improvements in bullets and tables to make the document more understandable. Photos have also been greatly improved. Several new sections have been added, including sections on stamped and formed open barrel contacts, shrink sleeping for wire support, raceway assemblies and grommets. The camaraderie created at the exhibits and networking events is a big part of the value proposition of a WHMA conference. This is exemplified at the round table discussions that capstone all WHMA events. Subjects covered included risk management, using A-620 effectively, cost controlling, and workforce development. During the cost control discussion, reference was made to the high cost of on- boarding new employees. Rick Bromm, President of Altex Engineering shared their employee referral program. Employees receive a $100 bonus for referring suitable candidates. The bonus is paid after 90 days, and the new hire also receives $100. Rick reported that the program has led to a higher level of candidates and higher retention; all at a great cost saving.